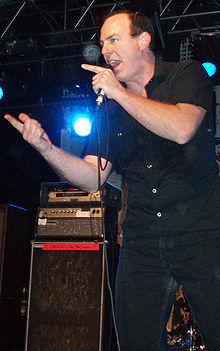 Gregory Walter Graffin, Ph.D. is an American punk rock musician and college professor. He is most recognized as the lead vocalist and songwriter of the noted Los Angeles band Bad Religion, which he co-founded in 1979 and is the band's only constant member, even though it now features two of their original members, guitarist Brett Gurewitz (who left and rejoined the band twice) and bassist Jay Bentley (who left in 1982, but returned in 1986). Graffin obtained his Ph.D. at Cornell University and has lectured courses in life sciences and paleontology at the University of California, Los Angeles.